Is it the DWP or Capitalism that Kills? First it was ATOS now it is Maximus. The government has moved on, now using the American multinational – a company providing so-called medical and human service operations in a variety of countries, including the US, Australia, Saudi Arabia and beyond. Previously it had used the French software based multi-national ATOS. They abandoned their contract early citing such things as threats to staff whereas in reality it had a lot more to do with the rapid plunge in the ATOS stock values because of all the bad publicity garnered through their manner of implementing the contract, based on the explicitly inhumane wording of briefs given by the ministry to the company. ATOS have compounded all of this by recently refusing to disclose the profits made through their operation of the disability contract. The signs are that Maximus will operate no differently than its predecessor. For months there have been open calls from countless sources for the government to make public the figures concerning deaths relating to benefits, particularly ESA, IB, DLA and related benefits. They had steadfastly refused saying that they were incapable of doing so because their records were not designed to do any such thing. Oddly enough they have just managed to do precisely that. It is also strange that this comes hot on the heels of the recent scandal over the DWP sanctions leaflets – where “real life examples” turn out to be fictitious statements used as quotes from fictional claimants (modelled by actors). Ian Duncan-Smith (IDS) Secretary of State for Work and Pensions (DWP) confesses this is a scandal yet he is precisely at the very top of this particular pyramid of power. He has made it plain that he has nothing but contempt for the unemployed and other benefits claimants within the purview of his ministry. This is the ministry, after all, that has made it a matter of course to effectively use slave labour in the ordinary course of its business. They are currently propping up a whole raft of businesses run by their buddies (like Sports Direct), as well as charities which are essentially corporations in their own right. People are forced to work for their benefits thus lowering the general average wage rate, whilst major corporations and the like earn additional profits as a result. The DWP jigsaw – does it fit? All of this is only part of the story still … Massive changes are continuing to grind through the system which is not fit for any human purpose. It is fit for purely the purpose of capital and its lieutenants on to its generals. 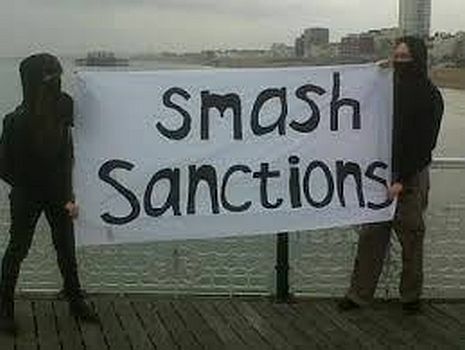 Changes previously promised to the whole benefits system have ground to a halt – typically efficient for the capitalist class, these changes were supposedly to simplify the chaotic system, all that we have seen is more chaos. Along the way new regimes have been instituted regularly within those benefits areas relating to health. It is not enough that the so-called health service is farmed out to major businesses to provide half-hearted care at a major profit to themselves, we have to bear the brunt of the lack lustre attempts to help us. The disabled are put through hoops in pursuit of enough money to live, in addition to often having their housing put under threat. Those with long term health issues are also made to endure endless failures of the bureaucracy (also a privatised affair) and assessments hamstrung by scripts generated by bureaucrats and functionaries with no real knowledge and certainly only having eyes and attention centred on budgets and the principles of a government and class whistling a single tune - that of profit for their class allies. The result of all of this, as we all should know, is that there has been a string of deaths directly related to all of this. Figures released today by the Department for Work and Pensions that show 81,140 people claiming ESA, IB or SDA died between December 2011 and February 2014. Of those, 4,010 (4.94%) had been deemed ‘fit for work’ following their WCA. Meanwhile, of the 50,580 people who died while claiming ESA during the same period, 7,200 (14%) were placed in a work-related activity group designed to help prepare them for work. A statistical release published today (August 27) in response to my Freedom of Information request dating back to May 28, 2014, states that the total number of deaths involving claimants of Incapacity Benefit, Employment and Support Allowance and Severe Disablement Allowance – between the start of December 2011 and the end of February 2014 is 81,140, including 50,580 (ESA claimants) and 30,560 (IB/SDA claimants). All figures are rounded up to the nearest 10. Add this to the 10,600 deaths that were already known between January and November 2011 and you have 91,740. 7,540 deaths while claims were being assessed, bringing the known total to 9,740. 7,200 deaths in the work-related activity group, bringing the known total to 8,500. 32,530 deaths in the support group, bringing the known total to 39,630. And 3,320 deaths in which the claimant was not in receipt of any benefit payment and is therefore marked as “unknown”. The total number of claimants who flowed off ESA, IB or SDA whose date of death was at the same time and of those the number with a WCA decision of “fit for work”, between December 2011 to February 2014 was 2,650 (2,380 ESA, 270 IB/SDA). And the total number of individuals who flowed off ESA, IB or SDA whose date of death was at the same time with a completed appeal following a WCA decision of “fit for work”, Great Britain: December 2011 to February 2014 was 1,360 (1,340 ESA, 20 IB/SDA). The new numbers suggest the average number of deaths per day between January 2011 and February 2014 was around 79.5 – 556 per week. Again quotes from Green party spokesman taken from DWP press release. The DWP figures talk about deaths during the particular period of around 2,300 which cannot be fully and properly explained. This is fairly typical for them – they have recently made public that during certain assessments and tribunals as far as they are concerned those officials presenting evidence on behalf of the DWP do not have to be fully truthful, they are allowed to omit facts relating to a case and also not state the full truth about such matters. Par for the course we can only think! Now IDS is facing new enquiries – after the fake quotes on DWP sanctions leaflets, IDS tut tutted, he is now facing investigation by the UN. Inclusion Scotland – a disability group consortium – have been notified by the UN that they will be sending representatives to the UK to investigate what it considers to be human rights violations relating to the disabled. Previously UN sources had stated that they considered the bedroom tax a serious attack upon the rights of disabled and that the UK was 'shocking' in its treatment of the vulnerable. This comes hot on the heels of the eventual announcement that 2380 people had died between 2011 and 2014 after being declared fit for work. Another figure of over 4000 people dying relates to those in addition to those previously declared to be disabled. In addition it should be mentioned that the Independent Living Fund was scrapped in July 2015, saving around £320 million, it cut the income of many of the disabled by hundreds of pounds per week, this was money often used to employ carers, thus many are doomed to life in institutions rather than out in the community in their own homes. It is plain that this government and New Labour previously have no sense of humanity whatsoever. We are returning to the sense of centuries past, as capital quietly crumbles, we are forced to suffer those consequences. It is certainly the case that the DWP, in its treatment generally of the unemployed is haphazard, at least on the surface of things. Those who have health problems are, in essence, being shown the path to the abattoir or something similar. One absolute is that those within the working class, whether employed or not, are seeing their labour power devalued hand over fist. With workfare, the work programme, the expansion of zero hours contracts, a general policy is well underway in reducing the true value of labour which the introduction next year of a minimum (not living – another government lie) wage (which is too little too late) will not alter. We can expect further premature deaths, and more attacks on “scroungers” in the media. This will be the case whoever is in control of the capitalist state since a crisis-ridden system offers only more misery down the road. It’s not just the Tories or the DWP but capitalism that is not fit for the purposes of humanity.